Minneapolis Saint Paul Economic Development | Greater MSP - Thinking About Reshoring? When was the last time you took a serious look at your supply chain? You may be surprised to learn that many of the advantages to offshoring have eroded in recent years. The rising cost of foreign labor, long lead times, high shipping costs, and intellectual property concerns are just some of the reasons companies are choosing to manufacture in America once again. If you’re considering reshoring, remember, you don’t have to go it alone. 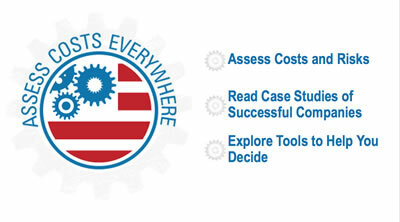 The Access Costs Everywhere (ACE) webpage was created by the U.S. Department of Commerce to provide information about the advantages of manufacturing in America. The first thing to ask yourself is whether it’s feasible from a cost standpoint. Luckily, there are a few ways to find out. The Access Costs Everywhere (ACE) webpage – created by the U.S. Department of Commerce – has a wealth of information that lays out the advantages of manufacturing in America. ACE analyzes costs across 10 indicators, including labor, shipping, product quality, energy, and real estate to show how making in America is a sound financial decision. The Total Cost of Ownership Estimator – a free online tool created by the Reshoring Initiative – helps quantify the hidden costs of offshore production. Company representatives input their firm’s unique data into a calculator that outputs 30 different cost and risk factors involved in manufacturing overseas. These tools have helped companies run the numbers and determine if reshoring is financially viable. Government partners at the local, state, and federal levels are eager to assist companies to return home. One organization operating at all three levels that can be particularly helpful is the Manufacturing Extension Partnership (MEP). MEP is a federal program, but it has a physical location in every U.S. state and customizes its programs to the local manufacturing ecosystem. MEPs provide technical assistance to help companies improve efficiency, reach new customers, innovate, and even to reshore. Contact your state’s MEP center today to discuss your needs with them. Reshoring doesn’t always mean pulling out lock, stock, and barrel from a foreign country. Often, OEMs are able to onshore their supply chains by switching to domestic suppliers that can make part or all of their components stateside at a similar or better price than their foreign competitors. Finding qualified domestic suppliers is another task your local MEP center can help you with. Many other federal agencies are eager to lend a helping hand. The Economic Development Administration (EDA) is at the ready with grants to finance infrastructure needs for companies that require new access roads or utility extensions. ENVE Composites’ investment in Utah’s Ogden Business Center is one such beneficiary of EDA’s reshoring support. Where to locate your facility is another question EDA can help answer, thanks to the National Excess Manufacturing Capacity Catalog (NEXCAP) and U.S. Cluster Mapping. NEXCAP is an online inventory of underutilized industrial sites, and the Cluster Mapping tool can identify areas with a strong supplier presence for an array of industries. And of course, don’t forget about your local economic development organization. Economic developers can help you with real estate, permitting, supplier identification, and maybe even tax incentives to make your return home a little smoother. If you’re on the fence about reshoring, or if the thought has simply crossed your mind, don’t hesitate to reach out to any of these partners. You never know what a short phone call can lead to. Michael Langley is CEO of the Greater Minneapolis-St. Paul Regional Economic Development Partnership (GREATER MSP) and Chair of the International Economic Development Council(IEDC), which is a non-profit, non-partisan membership organization serving economic developers. The IEDC, which has more than 5,000 members, provides leadership and excellence in economic development for its communities, members and partners.